The Handheld Portal Device model from Portal. 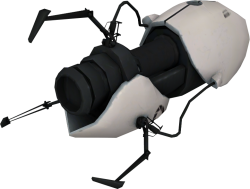 The Aperture Science Handheld Portal Device (also known as the Portal Gun, ASHPoD, Aperture Science Quantum Tunneling Device, or ASHPD) is the experimental tool designed to place two portals that objects can pass through. This is the primary tool players are equipped with to complete Test Chambers. The Handheld Portal Device is designed to create and place portals on any white surface that is immobile, flat and large enough. When the device is fired, a colored projectile will be emitted from the barrel. If the projectile strikes a valid surface, a portal of the corresponding color will be formed. If a portal of the other color is already placed, these two portals will be linked. If a portal of the same color is already placed, it will be closed and the new one will be used instead, limiting the player to the use of only two portals at a time. Nothing will happen if a portal is shot at an enemy or other object. The glass chamber and a light on the top of the device will glow with the color of the previously placed portal. 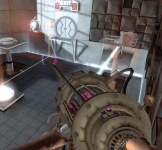 The Handheld Portal Device also has the ability to pick up and manipulate objects directly in front of it in the same manner as the Gravity Gun from the Half-Life series. While holding an object, the primary fire function will push the object forward very slightly, while secondary fire will drop the object. The Handheld Portal Device in Portal 2 behaves somewhat differently to its Portal counterpart. The key differences include new object handling sounds and animations, new sounds for firing portals and faster placement of portals by default. In addition, the Portal Device supports new animations and particle effects for moving portals and stretching objects; while it is possible to enable free rotation of objects via the use of a console command, the remaining functionality is only accessible through the use of a Razer Hydra controller, which allows for the greater degree of control of objects. The Portal Device in Portal 2 also lacks the ability to slightly launch/drop objects using the primary and secondary fire keys respectively. Beta version of the Portal Gun, with the label "F-22"
LEGO minifig Portal Gun prop. This page was last modified on 11 April 2019, at 16:42.